We were back from our book work break this week and added in another new activity. I know, we have a problem turning down fun activities, but I promise this one has benefits. Really. Amber has started to gain some weight, even though she still hasn't grown since October. It's becoming a tad worrisome that she might be at her full height (4' 11.75"). I was basically done growing at her age; we have my doctor's records that prove the fact. We still haven't been given the green light to resume dance, and at this point I'm not sure where it will fit in the schedule this semester. We have been working on deliberate exercise though. On Saturday, Amber finally used her birthday gift scooter. She accomplished one lap around our subdivision, which isn't that big, with me running / walking along. Then we turned around on Monday and went to the gym for walking. Amber managed a sedate mile on their elevated track, but she was wiped out pretty much until Wednesday. She did feel pretty cool though because this was the first time I didn't have to walk with her since she completed the weight room orientation class. That also meant I could use an elliptical machine, the one thing we don't have at home. I made a bunch of new and old recipes this week, some of which we won't be using all that often, but they all turned out pretty good. I made edible baked macaroni and cheese (gluten free) for the first time, ever - just to realize that we might have a dairy issue with Amber. 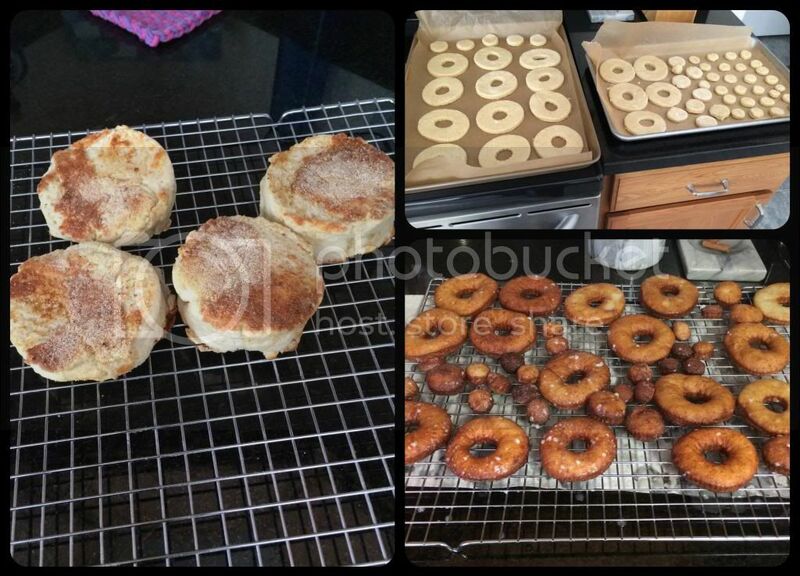 I also made gluten free yeasted doughnuts that had to rise overnight in the refrigerator, be rolled out, cut, rise again and finally be fried. They were good, but that's not happening often. I also tried making my own gluten free English muffins, which turned out to be the best of all my endeavors. They didn't have quite as many nooks and crannies as the store bought brand, but they tasted just right and only had one 30 minute rise. I can make those regularly. (LEFT) Homemade English Muffins. They look a little crude, but tasted wonderful. (RIGHT) An old favorite of Amber's - yeasted doughnuts. Cut out and then fried with a simple glaze. Not quite Krispy Kreme, but close. We met with the dietician last week to discuss the array of food reactions we have seen and to get feedback. I just love our dietician. She is not pushy, but helps me sort the data we have gathered and gives me structure and goals for the future. Some of the data had looked to me like Amber was reacting to almond flour (fructans), which it seems she was. Almond milk is still questionable because even though the fructans are water soluble, which means a goodly amount are lost in making the milk, we don't know if enough are lost. We had switched to Lactaid, lactose treated cow's milk, because it is also believed that Amber reacts to lactose. That brought about a whole new set of symptoms that the dietician believes to be a casein intolerance. We have removed dairy and added it back in a couple of times with the same result. We go next week to see the GI doctor, but it appears more testing is coming up to determine the exact nature of Amber's milk issues. For now we are back to almond milk and no dairy except for limited amounts of cheese (okay, so today was the only day with cheese) and butter at restaurants only. Baking is fun around here with the substitutions. Amber finished her art classes at the Painted Pot this week. I'm a little sad that she won't be going back for the last session of the school year, but we just don't have time that day because of "church stuff". We've also been working on Amber's crocheting skills. She decided that loom knitting was limiting her too much and sat through a crochet lesson with me. She has so far learned the simple chain stitch and single crochet stitch. She's still pretty awkward with crocheting, but then she was the same when she first started knitting. (RIGHT-TOP) Multi-week project from Painted Pot. Mixed media mosaic. 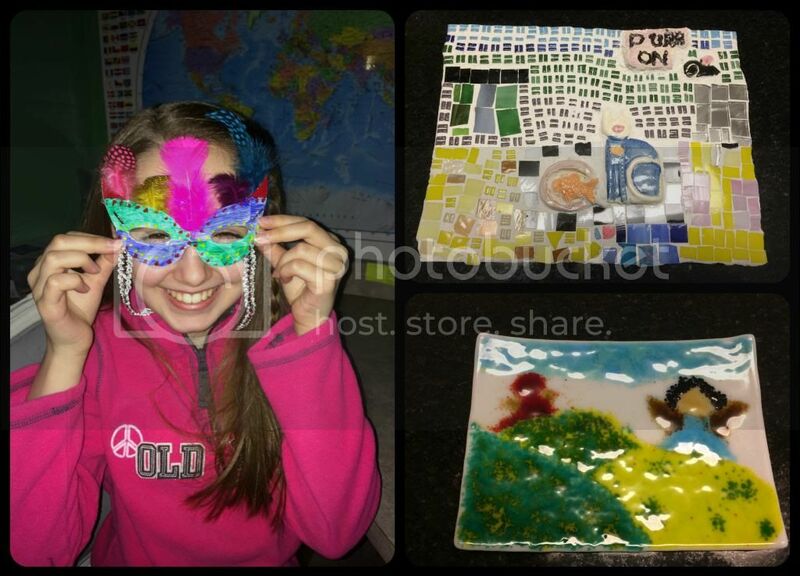 They created and painted clay items, then used with glass to create the final project. (RIGHT-BOTTOM) Glass fusing project. It's from one of Amber's books, a dragon and an angel. Amber used all glass frit for this project. The new activity... it's actually an activity for both Amber and me. This new activity is an old activity come back around at the new church. Did that make sense? The new church's adult handbell choir had a couple of openings, for reasons unknown to me. We were asked about joining and ultimately it was decided that both Amber and I would join. Amber is the minimum age they take, but she has the experience with bells and chimes from our previous church. I have the desire and know how to read music. My piano experience is apparently a hindrance in this situation. Our first practice with the group was this week. Amber did great! I ... am a work in progress. At least I kinda know how to ring a bell now. If I could only manage to not get lost in the music. I'm hoping a good deal of the problem was my inability to get noise from my bells at the moment I desired. We have a performance in mid-March. Amber is working with me at home on my bell technique. Talk about a reversal in roles. Amber has always adored bell playing and it was the one sadness about leaving our previous congregation. Now she is back in bells and giddy about performing. This is an activity that Amber and I can do together (we stand right next to each other), instead of me leaving her for one of her activities. It also helps us get involved with our new congregation. If that wasn't enough I learned after our first practice that Bell choir counts as church service hours for Amber. If she continues with the bell choir through middle school it will be all the church service she is required to complete for confirmation. There will be other events she participates in, but we will have the required hours covered easily. (LEFT) Scootering! She never did take to bike riding, so back to scootering she goes. Sometimes our schedule and Amber's dietary needs become so overwhelming, but this week I've been purposely trying to concentrate on the positive in our life. I really am astonished at all the wonderful changes that have occurred in the 2+ years since we started homeschooling. We found the best dance studio imaginable, even if Amber isn't dancing right now. We've found the perfect flute teacher, by accident, and a great band that Amber loves to attend. The homeschool group has been one of the biggest blessings and it was a random Facebook add for me in the beginning. 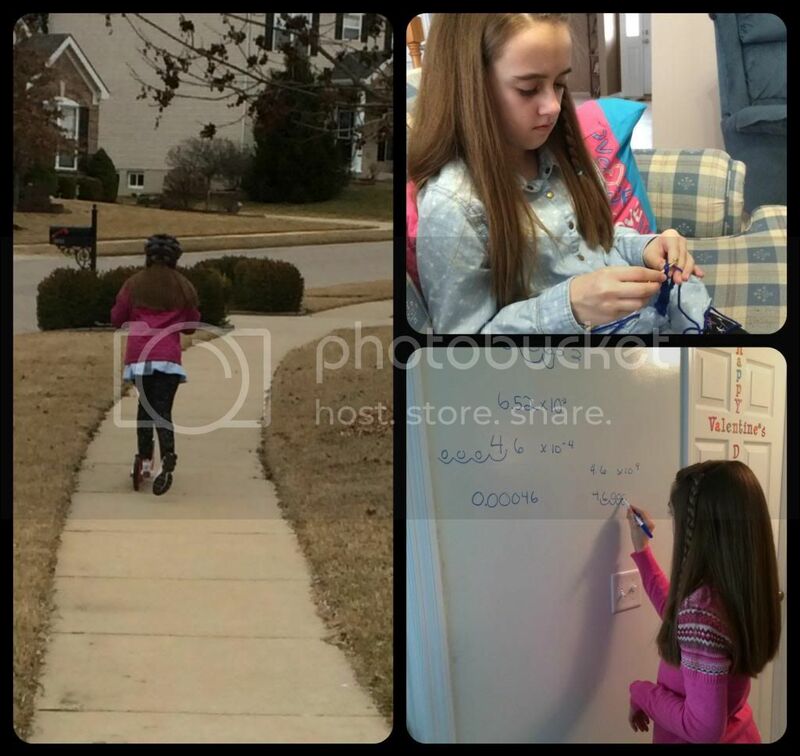 The homeschool group lead us to find our new congregation where Amber is thriving and makes new friends weekly. It's also a very homeschool friendly church as demonstrated by three of the kids in Amber's smallish 6th grade confirmation class being homeschooled. I've even found a great group of moms to socialize with and a Bible study that I'm enjoying more than any other in years. We have truly learned these past couple of months that every perceived negative can be a positive in some way; it all depends how we let it affect us. We are actively trying to find positives in every situation. So, even though dairy may not be Amber's friend anymore, without the compounded affect of dairy and other minor reactions, daily chia seeds might be all Amber needs instead of daily Miralax. Which is definitely a positive! 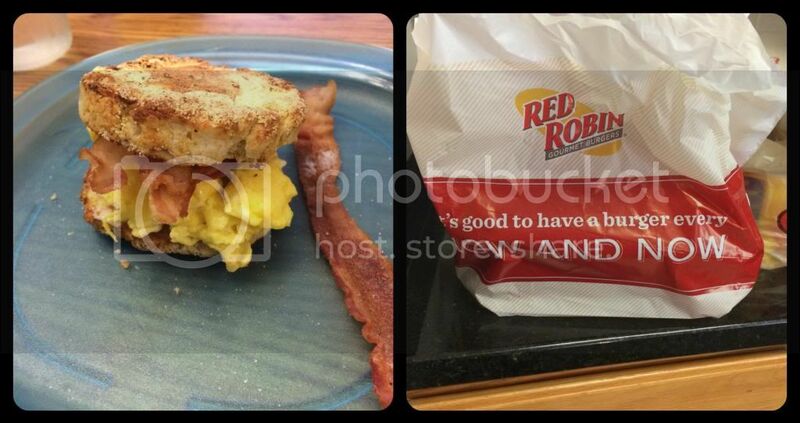 (LEFT) Amber's Bacon & Egg sandwich with homemade English muffin and Earth Balance soy free pretend butter. Another old favorite, that we've made new again for Amber. (RIGHT) Take out Red Robin Fries!!! An old favorite of Amber's has Gluten Free, seasoning free and entirely safe for Amber french fries. The confirmation class earned McDonald's on Wednesday, and we took fries so Amber could have something special too. This weekend we are awaiting another winter storm; the watch has already been issued. Ice, sleet, freezing rain and snow in large amounts are all forecasted over a 36 hour period for us. Amber and I have already been to the store for our almond milk, eggs, and chocolate (for me). If you are in the path of this storm, I hope you all stay warm and safe too. Philip was never going to be tall, he takes after my wife to much for that. The Chemo he had stunted his growth. Out of curiosity I just measured him and he is (4' 3.5") His endocrinologist say that he will hit full height eventually it will just take him a while longer. What full height mean remains a compete mystery. I like the idea of service hours for confirmation. My older two currently alter serve. When they are older they can switch to another task like reading or music. Margaret has been learning to crochet as well. I have no idea how far along she is. I LOVE the idea of service hours for confirmation. Amber is required to also serve as an acolyte, but that does not count for service hours. Which I think is as it should be. There are certain expectations for confirmation students, one of which is acolyting. They also should be in training for their adult life of service. Amber also has required community service hours, but our work with Heartland Humane Society has that covered. I love what you wrote, "We have truly learned these past couple of months that every perceived negative can be a positive in some way; it all depends how we let it affect us." I needed that right now - having some attitude problems with my 11 yr old son. I just need focus on how I let it affect me. "let" being the key word. We had dairy problems when my son was a baby, but he grew out of it at age 5. Praying for y'all! How old is Amber? My 13-year-old son is 4'7 inches tall and weighs 57 lbs. He was seeing an endocrinologist and found out that his growth hormone levels are a little low but not enough to be abnormal. He also had an x-ray to check his bone growth which showed that he has delayed bone growth. This is good because it shows that he's just a late bloomer. Have you ever had any of this checked? Amber is 12. She has always grown at a good pace and was actively growing when she got sick. By the time the doctors figured out what condition she has, she had lost 10 pounds and stopped growing. Her growth chart showed a sharp downward turn. Amber is doing better on the new diet, and gained some weight, but no height yet. She had an endocrinologist who says everything is good from that side. Her bone growth was normal before the illness too. She had leg problems and had to have her bones checked around age 4 and again at 10. Christy. I am so glad to hear that Amber has gained some weight and is able to do some exercising. I know it is frustrating but I love what you said about 'every perceived negative can be a positive in some way". We are going through some things and I try so desperately to look at it that way. I love the art she does. As for growing; I was 5'3" when I was 12 and I grew until I was 16 to 5'9". She will be the perfect Amber! God doesn't make mistakes. :) Stay warm and safe during your storm!! Hugs to you and your girl! I'm so glad to see that life is going so good for you guys. You sound so happy and excited about all the new activities at church! I'm so happy for you all! Myself and all my girls stopped growing at about age 12! It may just be that Amber is going to be a petite woman, or not! Bethany is only 5' 1", Rebekah 5' 3", and I am 5' 4". Rachel is the tallest at 5' 6"! Funny all the ways different people grow! Oh, all the food stuff must be so frustrating for both you and Amber, but someday it WILL be all figured out! Everyone is different sizes; it ones of those things that make us interesting! I'm 5'7", but 2 of my sisters are 5'3" and another only 5'. You never know! Health and happiness, contentment and living a good life are more important!